A look at the contradiction between health care spending and actual treatment. 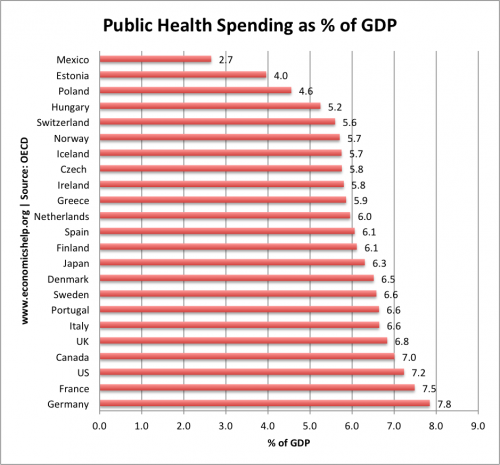 The US which spends more on private sector health care spending, still also has one of the highest levels of government spending on health care per capita. Furthermore, health care costs continue to rise, and place one of the greatest strains on government spending commitments in the developed world. 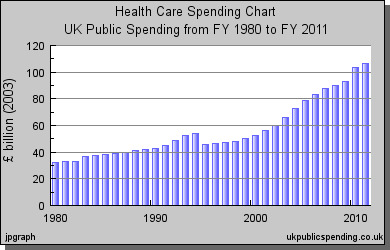 This graph shows total health care expenditure (including both public and private spending). The biggest spender by a long way is the US, which spends over $8,000 per capita. This compares to less than $3,000 per capita for Italy, Greece and Portugal. Admittedly, the number of hospital beds per 1,000 of the population is not a comprehensive guide to the quality of health care. 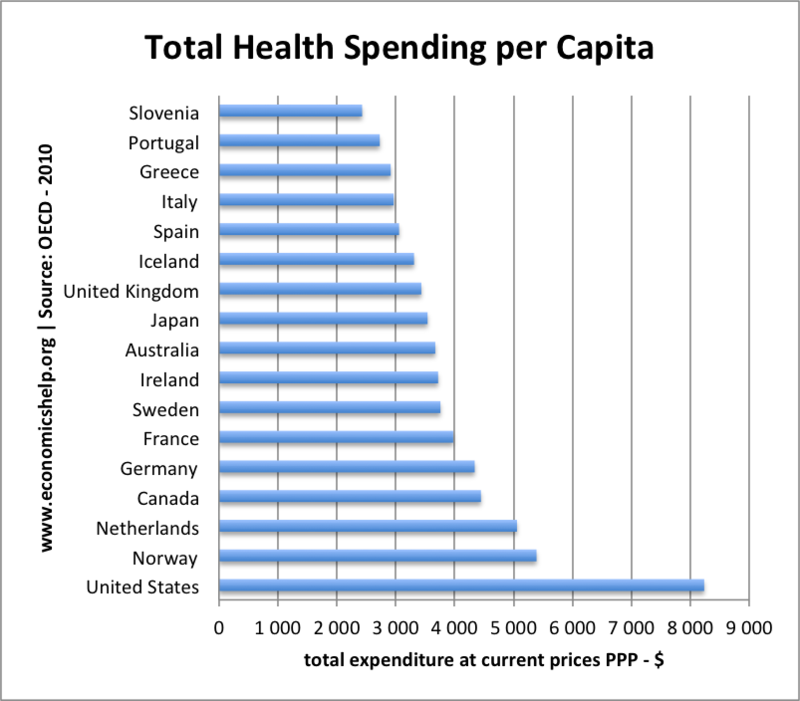 But, it is still interesting that the US has one of the lowest numbers of hospital beds per 1,000 (3.1) – despite the much higher total spending. 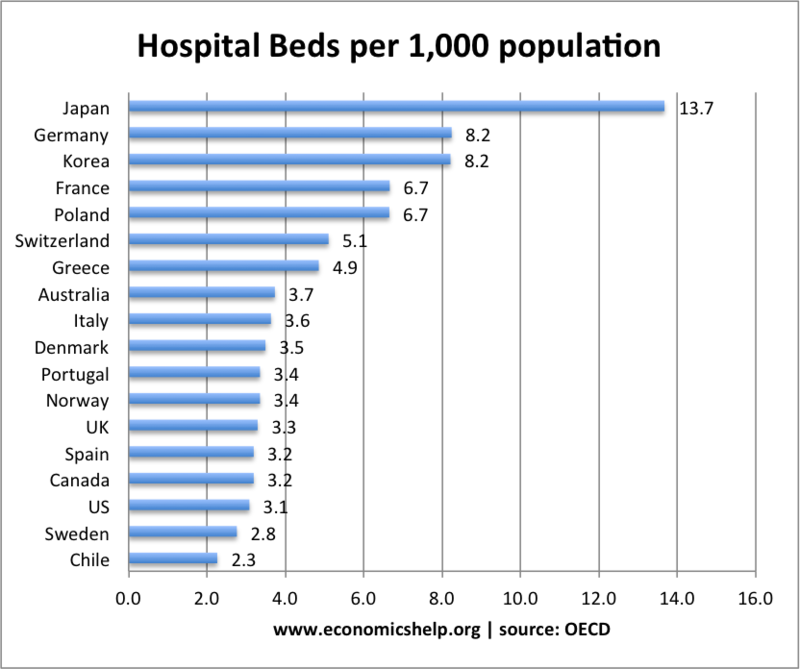 Japan has the highest number of hospital beds at 13.7/1000 – yet quite a modest total health care bill. On other measures, US seems to get poor performance from its spending. plus more expensive health care treatments now available. However, some countries have been more successful than others in restraining growth in spending. The growth in health care costs is the fastest in the US and a big reason for their long-term structural deficit. The past three decades have seen a large increase in real spending on health care, but there are still concerns we don’t spend enough. 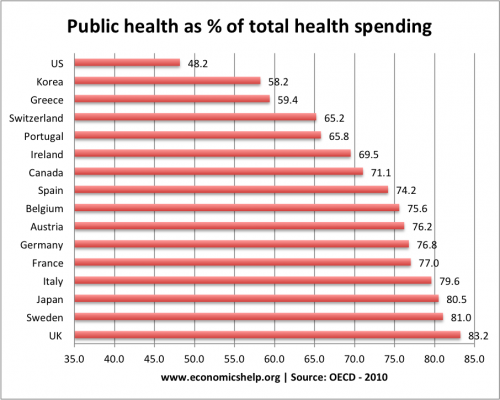 Health care costs have been rising in real terms, and as a percentage of GDP for most industrialised nations. 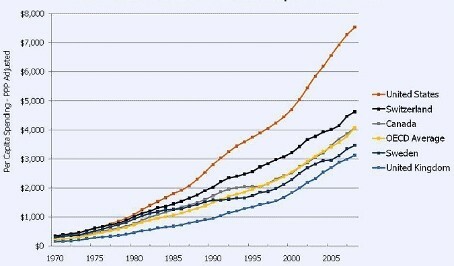 In a sense this is a good thing – as real incomes increase we can devote more resources to health care. However, the increased spending has not necessarily been matched by increased satisfaction in the outcome of health care services. Looking at statistics for the US, there is real concern that there system is very inefficient. Both public spending and private sector spending are very high – dwarfing any other country. The nature of the US health care system is to be very poor at any kind of cost control. There is little or no evaluation of the most expensive treatments and the pressure to keep increase spending is very strong. Despite the huge cost of US health care, a susbtantial part of the population can still slip through the net and be left unprovided for. Unfortunately, US health care is very hard to reform because the system has created powerful pressure groups who have vested interests in maintaining the status quo. But, the consequence is that the US is likely to see higher public and private sector spending on health care – increasing burden on employers, employees and the tax payer. This entry was posted in economics and tagged health care, stats. Bookmark the permalink.